Hassan Sharif, Jumping No. 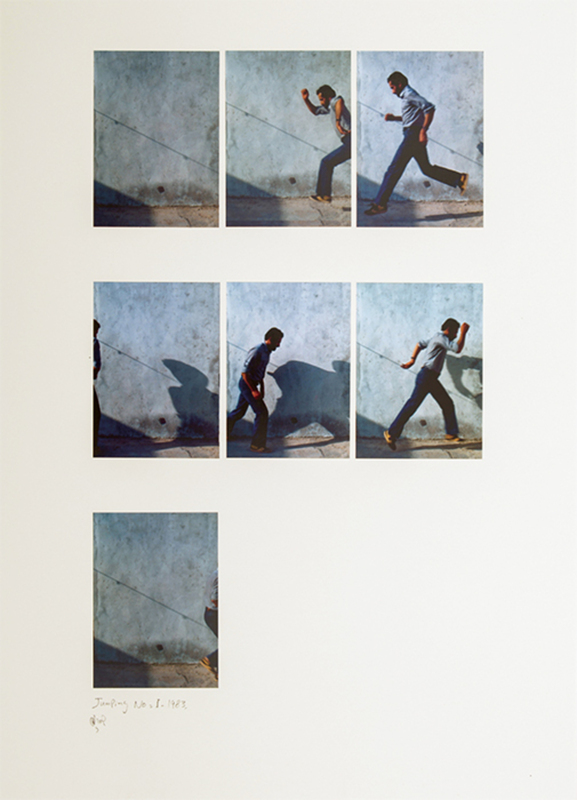 1, 1983, seven C-prints on cardboard, 38 5/8 × 28 7/8". International attention came late in life for Sharif, who was born in Iran, studied in London, established numerous community arts organizations in Sharjah and Dubai, and passed away last fall at sixty-five. He is routinely celebrated as the godfather of Conceptual art in the Gulfa region the art-historical mainstream rarely recognizes as a place of formal innovation, critical thinking, or noncommercial gestures. But most recent shows of Sharif’s work (including his current showcase in Christine Macel’s Venice Biennale) have largely elided his early dematerialized practicewhich included performances, urban archaeology projects, and works on paper described as “semi-systems”and instead emphasized his vast, accumulative bundles of stuff, which he began to produce in the 1980s. This retrospective promises to correct those omissions and also to pay adequate attention to his role as teacher, critic, and translator.